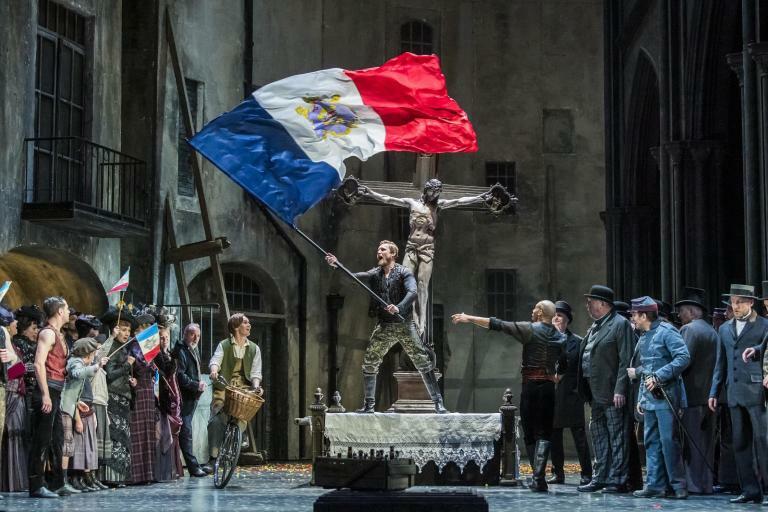 This was undoubtedly the big ticket opera event of this year’s EIF: there have been umpteen previews of it in the press (it’s already a massive hit in Berlin) and director Barrie Kosky is currently riding high in this country because of his lauded production of Saul at Glyndebourne. The hype was befitting for the gargantuan proportions of the production and its ambition which was, to my mind, carried off triumphantly. Kosky has teamed up with British Company, 1927, to turn The Magic Flute into a homage to 1920s silent cinema. Onto a blank screen with a series of revolving doors, a series of stunning visuals bring the action to eye-popping life, creating one memorable tableau after another. The opening scene, for example, shows Tamino running for his life through a wood with a vast golden dragon swooping after him, while later the Queen of the Night becomes a terrifying giant arachnid. The Trial by Fire is a huge fire-breathing monster while, on the more intimate side, Pamina sings Ach, ich fühl’s inside a snow-dome. It’s extraordinary to watch, and I found myself torn between guessing at what was coming next and revelling in the spectacle on display. The secret to its success isn’t just its visual appeal, however: it’s completely harmonious and not at all slapdash. It has clearly been created by a team who adore their silent cinema source material, and their realisation adds to Mozart rather than distracting from him. Monostatos, for example, is modelled on Nosferatu, while Papageno is reminiscent of Buster Keaton and Pamina of Louise Brooks. The consistency of the interpretation is the key to its success Some aspects are controversial, not least the replacement of the dialogue with silent cinema surtitles mimed to some of Mozart’s music for fortepiano, but it’s all part of a piece and so it works. If there is one disadvantage to such larger-than-life staging then it’s the fact that the humans can be reduced to ciphers, almost consumed by their projected surroundings; but then, many of the figures in The Magic Flute are types anyway, like the three boys or the Armed Men. The three ladies are certainly splendidly waspish here, with their fur coats and cigarette holders, and the Queen of the Night is elevated into something truly monstrous as the giant spider. Musically speaking, Beate Ritter’s Queen is flawless at the top of the stave and genuinely exciting to listen to. Dominik Köninger is a likeable Papageno, and (just about) manages to avoid being upstaged by his animated feline accomplice. Bogdan Talos is a competently impressive Sarastro, but doubles as a knockout Speaker. As the lovers, both Adela Zaharia and Jussi Myllys are sweet-toned and warm, if occasionally a little stretched on top. The orchestra play magnificently under the direction of Kristiina Poska, however, and the reduced chorus sound noble and dignified. It’s the appearance of this Flute that will stick with me, though, and I repeatedly thought to myself that it’s for out-of-the-ordinary things like this that festivals exist. The quantity of opera on offer at the Edinburgh International Festival may still be on the small side, but it’s creeping in the right direction, and Fergus Linehan has done a good job in his first year as director in picking performances that are well sung and impressively involving theatrical experiences. More, please!